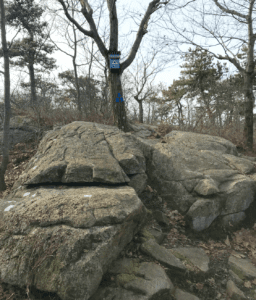 This is part 22 of excerpts from the trail log which was located on a New York portion of the Appalachian trail. For the post which explains this series, click here. You can read all the previous hiking posts by clicking here. After today, I will have less than 100 miles to finish my 18th, and final, traverse of the entire AT (9 thru-hikes, 9 section-hikes). I hope to finish the remaining 8 days in the Whites and Maine in early August. Perfect hiking day. Overcast. Upper 30’s, low 40’s. Much better than hiking here in the summer. And the water is nice and cold. As a rule, I do not include the hikers trail or real names in these hiking log posts. That’s because I didn’t get permission from each person to share their identity. They may not mind if I do share, but I still don’t feel right doing so. But this week is an exception because this hiker left his web site and his name in the blog. I checked his website and I think he’d be happy if I shared his information. So, the above post was written by Warren Doyle, who has a website www.warrendoyle.com. Dr. Doyle has walked the entire Appalachian eighteen times, for a grand total of 38,000 miles. And he wants others to be able to enjoy and complete the hike as well. His website indicates his main purpose is to provide realistic and comprehensive guidance about what hiking the Appalachian actually entails. He indicates about 80% of those who start the hike fail to accomplish it (for many reasons). Mostly though, it’s because the hikers were not prepared properly and did not understand how hard the trek will be. So Warren established the Appalachian Trail Institute which is located in Tennessee. About five times a year, he provides five day training sessions which include information regarding trip logistics, hiker safety and health, equipment, food, physical conditioning and the emotional aspects of long distance hiking. Each day’s training ends with a 5-7 mile hike. His website indicates 75% of the people who take ATI training complete the entire Appalachian Trail, compared to about 20% who don’t take the training. His website also provides information on SmartHikes which is a way to hike the entire trail by doing day hikes, with van support. The van carries clothing, shelter, food, sleeping bags, water and extra footwear. So the hikers complete the trail, but without having to carry all their gear every day. I am thrilled that Warren took the time to sign into the Appalachian Trail log that we maintain on a tree in Monroe NY. And I am even happier to read of the time and effort he has placed into helping others enjoy the experience as well. Perhaps one day I will find myself at the ATI!